The voice command system enables the hands-free system to be operated using voice commands. Operations of the voice command system can be performed by selecting the menu corresponding to each function on the screen. Even if any menu is selected, commands displayed on all menus can be operated. 1 Press the talk switch. To cancel the voice command system, press and hold the talk switch. 2 After a beep sounds, say the desired command. On the list screen, you can select the desired command. ●It is unnecessary to speak directly into the microphone when giving a command. ●It is not necessary to wait for the confirmation beep before speaking a command. • Spoken at a low or high volume. • The roof or windows are open. • Passengers are talking while voice commands are spoken. • The air conditioning speed is set high. • The air conditioning vents are turned towards the microphone. ●In the following conditions, the system may not recognize the command properly and using voice commands may not be possible: • The command is incorrect or unclear. Note that certain words, accents or speech patterns may be difficult for the system to recognize. • There is excessive background noise, such as wind noise. Due to natural language speech recognition technology, this system enables recognition of a command when spoken naturally. However, the system cannot recognize every variation of each command. In some situations, it is possible to omit the command for the procedure and directly state the desired operation. Not all voice commands are displayed in the short cut menu. This function is available in English, Spanish and French. 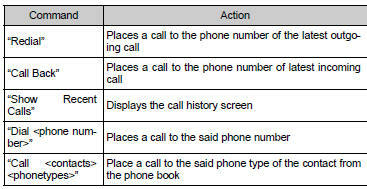 Some recognizable voice commands and their actions are shown below as examples.